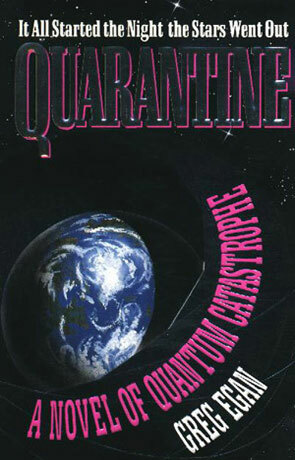 Quarantine is a science fiction novel by the Australian author Greg Egan. Yet another book, by an author that I have never read anything by before, but with Greg Egan I have a good excuse: He's a fairly new writer - On third page of the book there's a Books by Greg Egan and all it says is Quarantine and Permutation City (I have Permutation City, but haven't read it yet). Buying books by mail order and therefore unseen, can bring surprises of both the good and the bad kind - getting a book with the words A Novel of Quantum Catastrophe on the cover, is a bad thing in my book (it doesn't help that it's in an ugly pinkish color). I probably wouldn't have bought it, if I had seen the cover. A line like that sounds too much like the headline on a bad sf flick from the fifties. Anyway the back cover sounded much better and I started reading this book, expecting a High-Tech Private Eye thriller. I was wrong - again. Quarantine starts of as a Hightech PI story, but quickly changes to something ... else. I'm not quite sure what to call this story or how to describe what its about. The tech is nanotechnology - mostly used to change the way our minds work, but this is not really what the story is about - it's not really about what we become when we change ourself, but in a way it is. In some ways it actually is about a "Quantum Catastrophy" - it is not just a bad catch line. And with the last page read, it doesn't sound as silly as the first time I read the cover. I like Egans writing style. I am not crazy about it, but there wasn't anything about it that bugged me or turned me off from the book. It has a nice flow and it tells the story well, without getting too long. In some ways the writing (not the story) reminds me of Asimov - it's clear and easily understandable and therefore seems ordinary. I hope that I will soon get the time to read Permutation City.